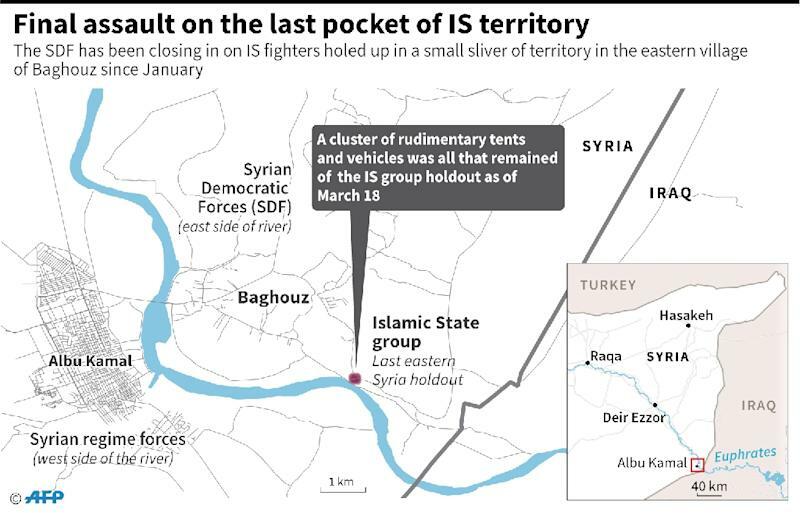 Baghouz (Syria) (AFP) - Holdout jihadists scurried along the reedy banks of the Euphrates in an increasingly desperate defence Tuesday of the last scrap of their "caliphate" in eastern Syria. Advancing Kurdish-led forces forced diehard fighters from the Islamic State group out of the main encampment where they had been confined in recent days. The move brought a months-old operation to wipe out the last vestige of IS's once-sprawling proto-state closer to its inevitable outcome but the Syrian Democratic Forces stopped short of declaring the battle over. Some of the jihadists now fighting for a few fields in a bend of the river seemed unwilling to surrender and a senior IS leader even issued a message calling for attacks. 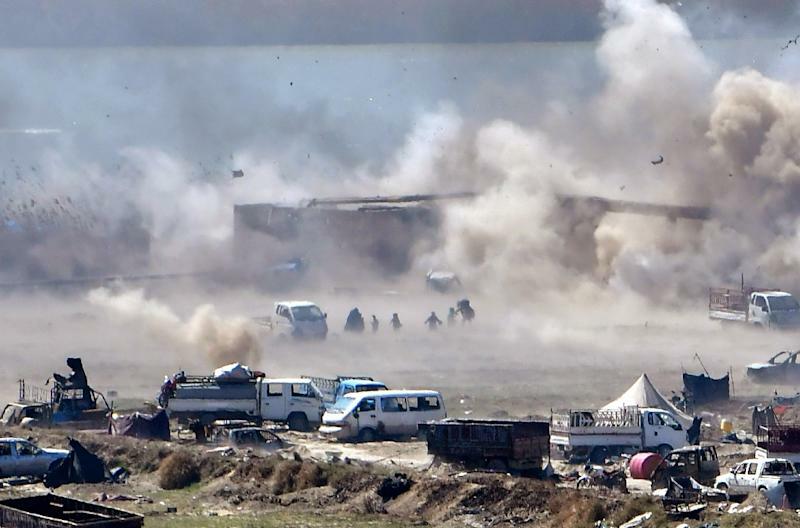 A few days ago, the last denizens of the IS "caliphate" were crammed into a chaotic encampment on the edge of Baghouz, a jumble of mangled vehicles, hastily-dug berms and makeshift tents. Thousands of people have fled the death trap in recent weeks and turned themselves in. The Kurdish-led force moved in Tuesday and took up positions in the deserted encampment, leaving holdout jihadists cornered. Syrian regime and allied forces are deployed on the other side of the river and the border, preventing any escape. "Clashes are continuing as a group of ISIS terrorists who are confined into a tiny area still fight back," Bali said. With backing from the US-led coalition, the SDF has blitzed hundreds of fighters into submission in recent days. 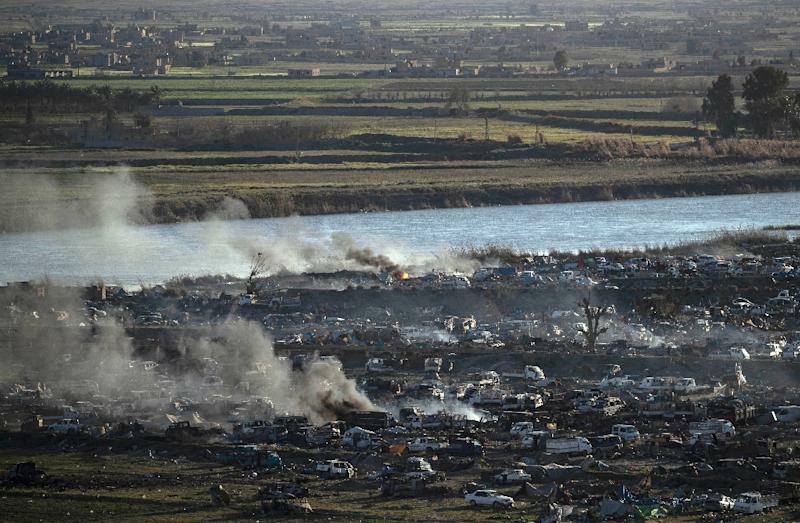 It said it captured hundreds more since gaining control of the camp. The sick and wounded fighters "have been evacuated to nearby military hospitals for treatment," Bali said. Another SDF spokesman, Jiaker Amed, said at least 1,000 IS supporters, including hundreds of jihadists and their relatives, had surrendered since late Monday. The SDF on Tuesday also said it arrested jihadists suspected of involvement in a January attack that killed four American personnel in the northern Syrian city of Manbij. The "caliphate" which IS supremo Abu Bakr al-Baghdadi proclaimed in 2014 once covered territory larger than Britain, straddling Syria and Iraq. The Baghouz holdouts are fighting over land the size of a few football pitches, but IS spokesman Abi Hassan al-Muhajir came out of months of silence to spur on his troops. "Avenge the blood of your brothers and sisters... Set up the (explosive) devices, deploy the snipers," he said in an audio message released late Monday. A video released on IS social media channels Monday showed bearded fighters in military fatigues firing machineguns as heavy winds swept through their crammed encampment. The crackle of gunfire filled the air, as they shuffled between rudimentary tents and mangled vehicles, some of them hobbling on crutches, as they waged artillery attacks. "My Muslim brothers everywhere, we have given everything we have," said one fighter in the video. President Donald Trump has ordered the complete withdrawal of US troops from Syria. But on March 7, US Central Command head General Joseph Votel said the fight against the extremists was "far from over". The conflict in Syria entered its ninth year last week, and the aid crisis spurred by the dying days of the IS "caliphate" compounded an already bleak humanitarian picture. The 70,000 people crammed into the biggest camp -- Al-Hol -- include more than 40,000 children, of dozens of different nationalities. In Damascus, Syrian President Bashar al-Assad met with Russian Defence Minister Sergei Shoigu on Tuesday to discuss coordination between their forces. "With Russia's support, a significant success in the fight against terrorism has been achieved," Shoigu said. In Homs, the UN envoy to Syria met with local officials, UN teams as well as displaced Syrians living in camps on the third day of his second visit to the war-torn country. "Path to a new Syria begins with confidence-building and reconciliation," Geir Pedersen tweeted. "Syrians need to come together to decide and build (a) future."